Firstly, apologies that the website was down for a couple of days, the webmasters were spirng cleaning it. It was the turn of the Edinburgh International this week on the “Seniors circuit” which seems to grow every season. Seniors the world over is the one growth area in terms of participants in National Championships. 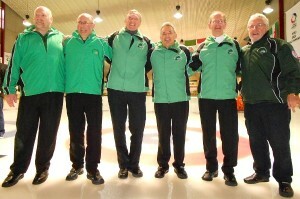 The Irish team participating was Johnjo Kenny’s team of Bill Gray, Neil Fyfe and David Whyte. David Hume was fifth man. Their first game was against a team skipped by Switzerland’s “Harry” Berger. A solid 9-2 victory for the Irish outfit. Next up were defending champs and Scottish senior champions, Gordon Muirhead with Norman Brown et al. A close affair with team Kenny needing to steal the last end to secure a point. JJ’s attempted raise behind cover was slightly heavy and his stone ran a few inches too far allowing skip Muirhead to pick it out for victory. Next up former Scottish men’s champion Willie Jamieson and his seniors’ team. Another nip and tuck game with Ireland edging it 6-5. The final section game was against another former Scottish champion, Graeme Adam and his Greenacres team. An unusually out of form Adam quartet were defeated 13-2. 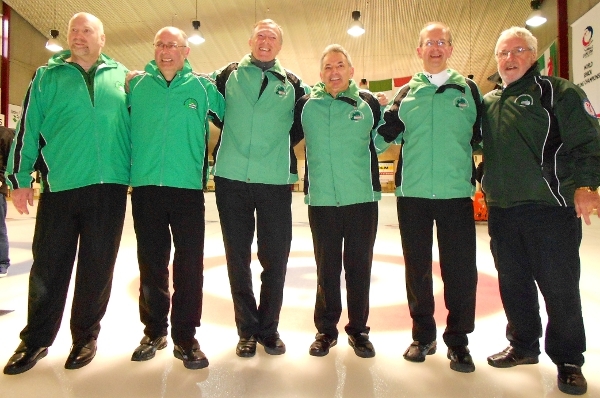 The vagaries of the schenkel format saw a quarter final draw pitting team Ireland against the only other senior men’s world champions from these parts, Keith Prentice and his experienced team. Another close game in an early morning encounter saw team Ireland one down with the hammer playing the last end. A difficult draw to the one foot for the extra end or a ten foot angled raise for the victory were the choices with skip’s last stone. 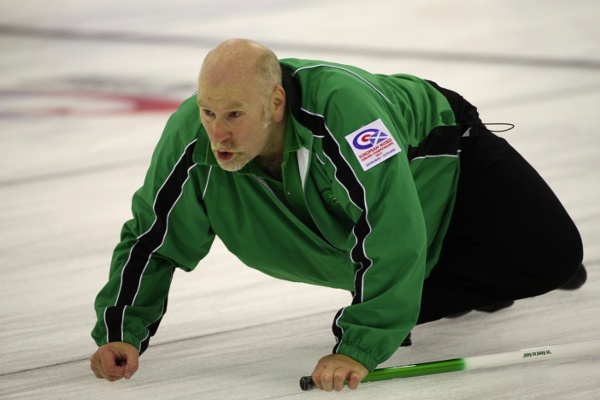 With one eye on the clock (the semi final was scheduled for some 25 minutes later) team Ireland decided to go for glory, however the last stone over curled at the last second and the target stone was missed by a few centimetres. Such are the margins! Team Prentice went on to win the Tournament. Johnjo and team however were happy with their tournament. The skip explained: “When we played at the Greenacres Invitation a couple of weeks back we thought we played well especially as it was January since I had played with the guys. We were a bit sharper again this week and providing we stay fit and can get the practice in over the holiday period we should be in decent shape for the Irish Playdown. There is still work required though…” he added!